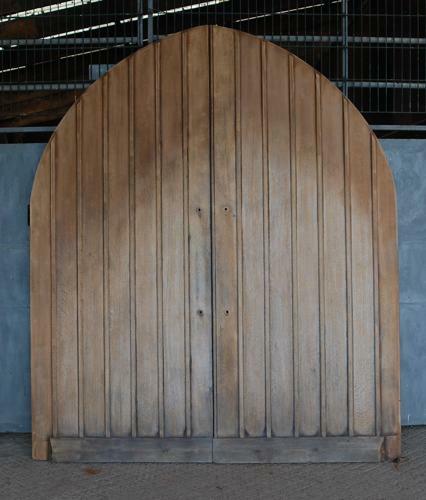 A fantastic pair of modern, reclaimed, solid oak doors with a Gothic style arched top. The doors are planked with an attractive crossed ledge and brace design to the internal face. They have a thick weather strip and have a rebated edge and fit well together. The doors have been cleaned to bare wood and are ready for a finish to be applied by purchaser, with perhaps an external oil or varnish. The doors are reclaimed and therefore have some signs of use and wear. The oak has some staining, greying to the base and colour variation, with paler patches. The doors have some marks and holes where door hardware has been removed. There are some small knocks and wear, especially to the base and edges. The doors have hinges and large bolts but receivers and other hardware will need to be supplied by purchaser. The doors have a very attractive design and would make a wonderful statement. The gothic style and the quality construction of the doors make them very desirable. Width of pair (not including overhanging weather strip) 217.5cm approx.